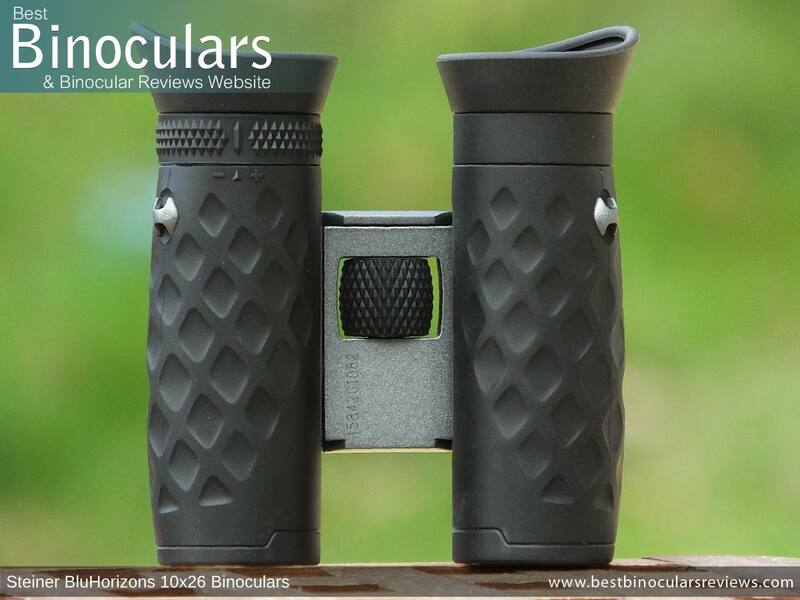 When you choose to use a compact binocular, you are sacrificing the light gathering ability of instruments with larger lenses for the convenience of having a smaller, more lightweight device to carry about. Thus if you follow this line of thought, it is very important that a compact is actually smaller and easier to carry and pack away than larger models, but at the same time, it needs to make the best use of the light that it does collect in order for it to perform at a reasonably high level and thus deliver as bright an image as possible. This is especially true in low light situations like when the sun is below the horizon, of if you are exploring a thick forest on an overcast day. 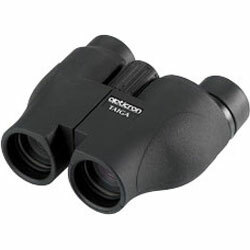 Available in either an 8x22 or this 10x26 configuration, the unique selling point of these compact Steiner BluHorizons binoculars is that they claim to be the first sunlight adaptive binocular. Working on the same principal as some sunglasses that contain photosensitive glass, they are designed to control the amount of light that gets transmitted through the binocular depending on the light conditions. The result according to Steiner Optik is that you get less glare and then in very bright light the image is less washed out than normal and thus will look more vibrant. As well as this USP, another important feature on the Steiner BluHorizons binoculars is that they use roof prisms and sport the double hinge design that I really love on a compact as it allows for a much more compact shape when folded down. 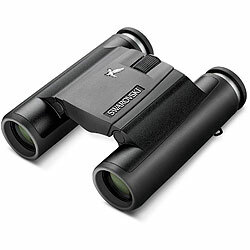 As I mentioned in the opening few paragraphs, one of the main features of these 10x26 Steiner BluHorizons binoculars is that they combine the compact roof prism shape with a double hinge body design. As you can read more about in the weight & dimensions section below, the massive advantage of this is the tiny shape that they are able to fold up into and thus make carrying and transporting them just about as easy as it gets. Another major advantage of the double hinge is that it permits you to have a much narrower IPD (Inter-Pupillary Distance) setting than which is possible on most other designs. So with a range that takes them from a maximum of 7.5cm, right down to 4.5cm, these Steiner binoculars are able to accommodate a much wider spectrum of users, including women and children that often have eyes set quite close together. Indeed as you will see in the photo below, this good minimum IPD and the small body shape meant that my 8-year-old daughter had absolutely no trouble using them. 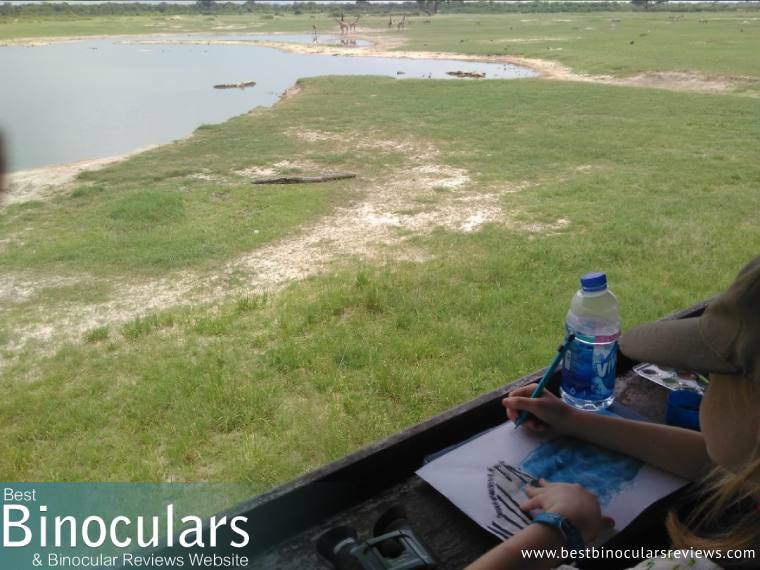 In fact it came to a point where my sample Steiner BluHorizons 10x26 binoculars became a constant companion of hers whilst we were on safari. Also important to mention here is that not only did the hinges open and close very smoothly, there was also enough resistance to make sure that they remain at your desired IPD setting to match the distance between your eyes. In the past, I have had binoculars where the hinges are either a little too tight or worse when they are too loose, which means that you constantly have to re-adjust them. Whilst not as lightweight as the polycarbonate ones, the bridge section and the hinges are made from metal and so not only does this look far better than the cheaper alternatives, but it also feels very robust. This is once again very important is it means the barrels are far less likely to go out of alignment should you accidentally drop or knock your binoculars against something. Whilst the bridge section is left exposed, the barrels have a rubber coating applied to them. Here Steiner Optics have opted to use a reasonably thick, but fairly hard rubber. This thickness certainly adds to the level of protection, but as it is quite hard, it will absorb less of the energy from an impact than a softer, more spongy rubber would. Firstly it vastly improves the resistance to perishing caused by oil, fuel, and other chemicals when compared to other types of rubber. It is also far less likely to age and harden due to sunlight and heat than other commonly used rubbers. 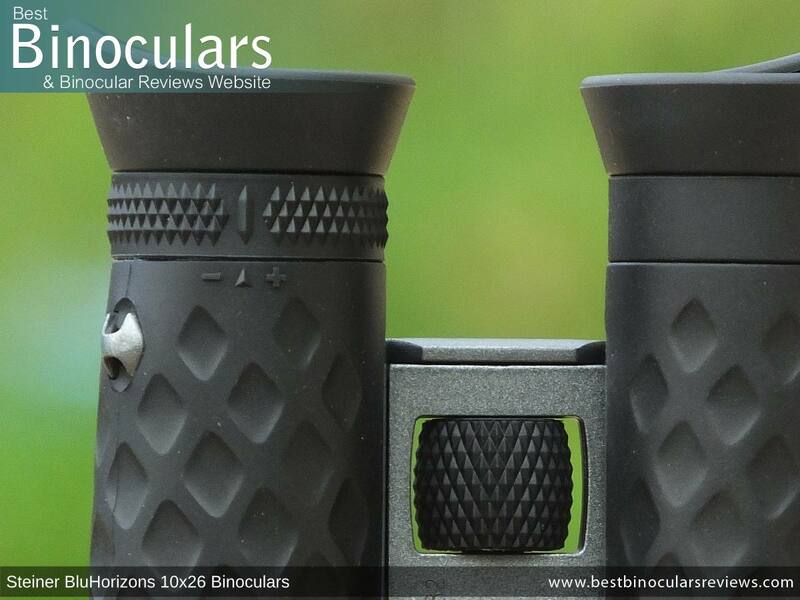 So whilst these may not be as attention grabbing highlights as some features, I rate them as very important and it shows excellent attention to detail because from experience I have had the rubber on many binoculars deteriorate and perish over time. 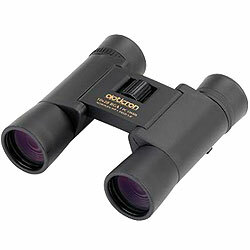 These Steiner BluHorizons 10x26 binoculars are advertised as being rainproof with a protection rating of IPX4. An IPX4 rating means that they are protected from spray or splashing of water in any direction for at least 5 minutes. Many compacts, especially lower costing ones are not at all sealed and even if they are, most do not supply an official rating or standard so it can be hard to compare and so whilst these are not rated as being completely watertight, I think for most normal uses this IPX4 level should be more than adequate. Indeed I did test them a little in this regard as I continued to use them in the rain whilst on safari and had no problems with water entering the system. The combination of their small size and anti-glare optics mean that I feel that the BluHorizons are a great pair of binoculars for skiing and so being able to resist water is of great importance. In terms of dust protection, an IPX4 rating means that they have protection form objects of 1mm or more from entering the casing. So technically these are not completely resistant to dust that has a smaller particle size. My personal experince is that I used them for a month on safari and travelled with them for almost 3 months, where it was often dry and dusty and had no problems with moisture or dust entering the system. 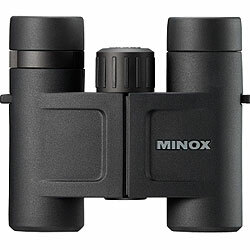 Note: Because the system is not 100% airtight these binoculars are not nitrogen or helium filled and thus the internal optics are not protected against fogging. This is a little disappointing, but it is fairly common for a compact at this price level. 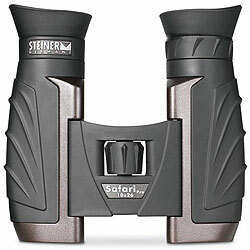 Whilst not as pronounced as those used on their larger instruments, these Steiner 10x26 BluHorizons binoculars sport the distinctive eye shield shaped eye-cups that are almost a Steiner trademark. As you can read on all my Steiner reviews, this is a feature that I really like as they block out light as well as any other distractions from the periphery of your view and thus make for a more immersive view that lacks some of the glare on the ocular lenses that you can experience when you are positioned with the sun at your side. To change the amount of eye-relief to compensate for the space taken up by wearing glasses, you fold simply down these cups. Unlike twist-up eyecups that you can often position at a number of points, folding eyecups mean that there are only two fixed settings, either full eye-relief or none. However, on compacts like this, this is not really a factor as the level of eye-relief is far less than what you get on most larger instruments anyway. In terms of comfort these are great. Made from a soft rubber/silicone material I found that I could press them quite fimly against my face for long periods without any form of discomfort. 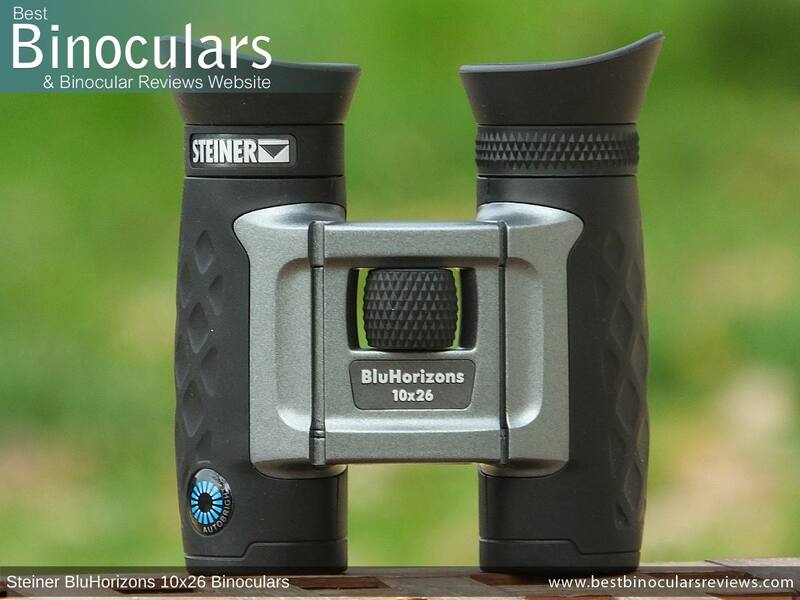 The focus wheel on these Steiner BluHorizons 10x26 Binoculars is great, especially when compared to other compacts of this type. Compared to full-sized instruments it is relatively small (17mm diameter & 18mm long), but it is well positioned which made it very easy for me and my 8 year old daughter to reach. Added to this, the action is very smooth and with just about the right level of friction to prevent unwanted turning, but at the same time making sure that it is easy enought to adjust the focus with a single finger. These attributes, along with its fairly prominent position above the bridge and the high grip rubberized diomand track also make it very easy to make focal adjustment even whilst wearing gloves. For use in winter and especially for activities like skiing, this is of great importance. In terms of the gearing, it takes 2 full turns (720°) to adjust the focus from one extreme to the other. This is on the lower end of the scale meaning that it takes a little longer to make large changes, but is easier to make small, accurate focal adjustments. In order to calibrate the instrument to allow for any differences in vision between your two eyes, these Steiner Bluhorizons binocular has a diopter adjuster. What is fairly unique is the fact that it is positioned on the left eye-piece, wheres most bins have it on the right. Other than to swap the order in which you calibrate the instrument, this really does not make any difference, but I thought it was interesting to note. The diopter adjuster itself works well and along with the diamond-shaped pattern in the rubber grip makes it easy to adjust. Personally, I would like it to have a little more resistance to movement so as to make it less likely that your setting gets moved by accident, but this is a very minor point. As is clearly illustrated in the table below, in terms of their weight, these like any good compact are far lighter than your average full-sized 42mm and mid-sized 32mm binocular. Compared to other compacts, these sit around mid-table, which when you consider they have a metal bridge is impressive. When looking for a compact binocular, it is especially important to take note and compare the dimensions as having an instrument that is both very easy to hold in the hands and then pack away is the main reason for their existence and the main reason why you would want one over a larger device. Here not only do you need to consider the 'official' dimensions when the hinges are open, but also take into account how small a package the binocular can be folded into when not in use. 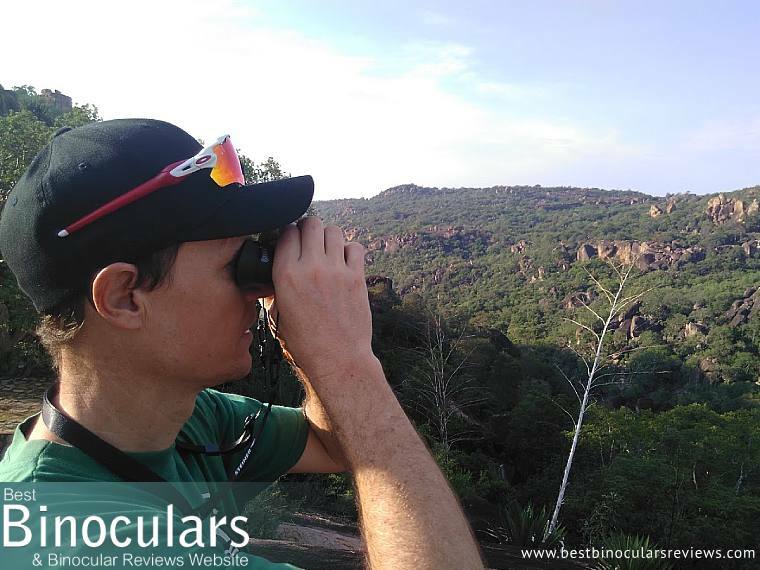 This is especially important for users like hikers, lightweight backpacking travelers and indeed those who will be using their binocular in combination with other equipment. For example those going on a walking safari with a camera as well. This is one of the main reasons that when it comes to compacts, I especially like the double hinge roof prism design as it enables the instrument to fold down into a tiny shape and is one of the real strengths on these Steiner BluHorizon binoculars. So as you can see from the dimensions and image above, because of the clever double hinge design, when you fold a double hinge binocular up it makes for a very small shape that will fit into must jacket pockets should you wish. This is one of the main advantages that this design of compact has over the porro prism models. 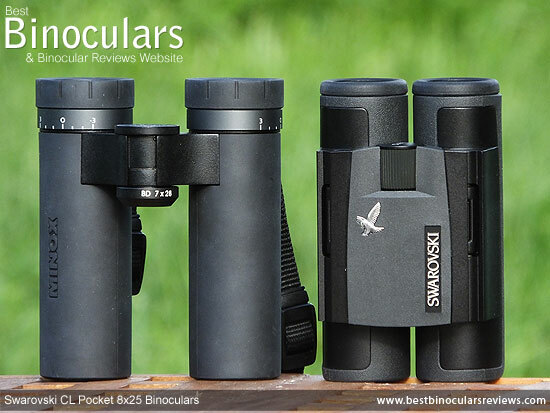 For more on this, take a moment to g through my article on the Best Compact Pocket Binoculars. As with the vast majority of optical brands, Steiner Optics are pretty coy when it comes to describing exactly what optical components and coatings go into their products, but I will do my best to describe as much as I can. I also have the advantage in that I recently had the opportunity to tour the Steiner factory in Germany which gave me a real insight into the components they use and indeed the amount of precision, skill and expertise that goes into all the products and at each step in the production line. Also well worth noting is that unlike many companies that use cheaper and inferior glass from China, Steiner only use very high quality optical glass from either Schott in Germany, or Hoya in Japan. 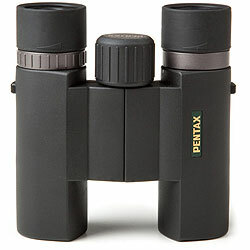 Both companies are considered to make the finest optical glass available and are used on the very best binoculars. I do not know the exact makeup and arrangement of the lenses in the eyepieces in these Steiner 10x26 BluHorizons binoculars, but what I can say is that I measured the outer ocular lens and it has a diameter of 14mm, which for a compact is fairly typical. 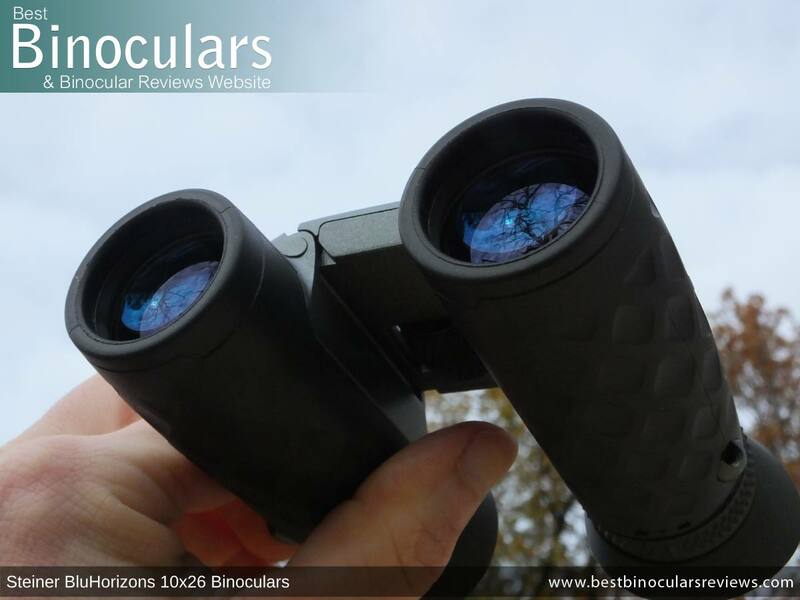 Larger binoculars also tend to have bigger ocular lenses, which do present us with a few advantages that you can read about in this article:: ocular lens size, but as I say these are fairly typical for this class of instrument. 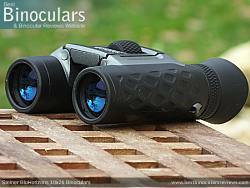 As the numbers in their name suggests, these Steiner BluHorizons binoculars have 26mm objective lenses, which for a compact is on the larger size as many tend to have objectives between 21mm and 25mm. The advantage her is that like the windows in your house, the increase in surface area makes it possible for them to capture more light which in-turn gives them the potential to deliver a brighter, higher quality image. Obviously on the negative side is that larger lenses are heavier and often results in a larger instrument. However as we have already discussed, due to the clever double hinge design, these fractionally larger lenses really do not negatively impact the overall dimensions to a meaningful amount. What I also like is that at 8mm, the lenses are set back quite deeply within the ends of the barrels, especially when compared to other compacts. This 'cover' helps prevent lens flair and provides the glass with a good amount of protection, from both physical damage and environmental conditions like light rain and dust. This results in better views and they will require less cleaning, which is always a good thing in ensuring that the lenses don't get permanently marked. Both models within the BluHorizons series use Schmidt Pechan roof prisms to correct the inverted image. This design of prism is more expensive to produce as they require a few extra coatings in order for them to deliver a comparable image quality as that of the porro prism design, however, the advantage is that they are able to produce a far more compact shape of instrument. Which in this size class is of paramount importance. 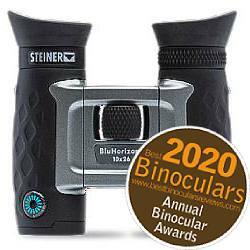 It is important to take note that Steiner BluHorizons binoculars are Fully Multi-Coated. The precise wording here is important as lets us know that multiple layers of an anti-reflection material has been added to all air-to-glass surfaces throughout the entire optical system. Lesser quality binos are only Fully Coated or Multi-Coated, and this makes a big difference to both the quality and brightness of the view. .
For more: What To Look For When Buying Binoculars & Anti-Reflection Lens Coatings. The name BluHorizons comes from the somewhat unique blue tint that the lenses give off when light reflects off of them. The reason for this color is the special coatings that Steiner use and which forms part of their AutoBright™ Optical system and which enables these binoculars to adapt depending on the amount of sunlight. Similar to eyeglasses that automatically adjust depending on how bright it is using photosensitive glass, these coatings are designed to eliminate glare and will automatically enhance the amount of light that gets transmitted through the lenses. In bright light the company claims that this results in improved image clarity and it is said by Steiner to eliminate glare or light shimmer from water, snow or sky. As well as an improved image, Steiner also say that it helps eliminate less eye strain caused by squinting in bright light. Whilst I have never really suffered from eye strain whilst using binoculars, it never really occurred to me before that this would be a good idea. However, after using these, my personal observations are that this system does work and whilst I personally did not need a binocular to help me with eye strain, these Steiner BluHorizons certainly delivered an image that looked more vibrant and less washed out in very bright light conditions. For more on this, read through my observations in the Image Quality section below. For a 10x compact, this Steiner BluHorizons 10x26 binocular has a really impressive field of view. Measuring 322ft wide/high at a distance of 1000 yards away (approx.107m @ 1000m), it is not only wider than most of the competition, but as you can see from the table below it even competes with many 8x instruments which is excellent. This comparatively wide view combines with the relatively powerful 10x magnification will most certainly be of interest to a wildlife observers and some birders who often explore wide open areas where their subjects are often at slightly longer ranges (like at the coast, on the African Savannah or in the hills to name a few examples). Steiner Optik do not publish the 'official' minimum focus distance on these, but I measured it to be about 9.8 feet/ 3 meters. Here on BBR, I regard a minimum close focus of 6ft or less as being excellent, so at 9.8ft, these compare well against similar instruments (see table below) are thus rated as good, but not quite excellent. Out in the real world, this means that they are fine if you occasionally like to direct your view towards a butterfly, flower or indeed bird on a nearby bush, but these are certainly not the ideal option if this is your primary interest. 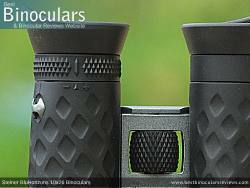 At just over 12mm, the level of eye-relief on these Steiner BluHorizons binoculars is good, but not excellent for an instrument in the is size class. I tested them by folding down the eye-cups and putting on my sunglasses. The result is that the field of view is indeed a little restricted and you do get a dark ring forming around the edges. This means that for the vast majority of users this will be perfectly adequite, but if you wear glasses or specifically require a binoculars with long eye-relief, these and indeed most compacts will probably fall a little short. Note: Due to the fact that I was travelling, I did not have my usual selection of benchmark binoculars with me to compare the view through these against. However, I did also have the Steiner Predator AF 8x30 binoculars and a couple of mid and high level 10x42mm binoculars that may parents were using. 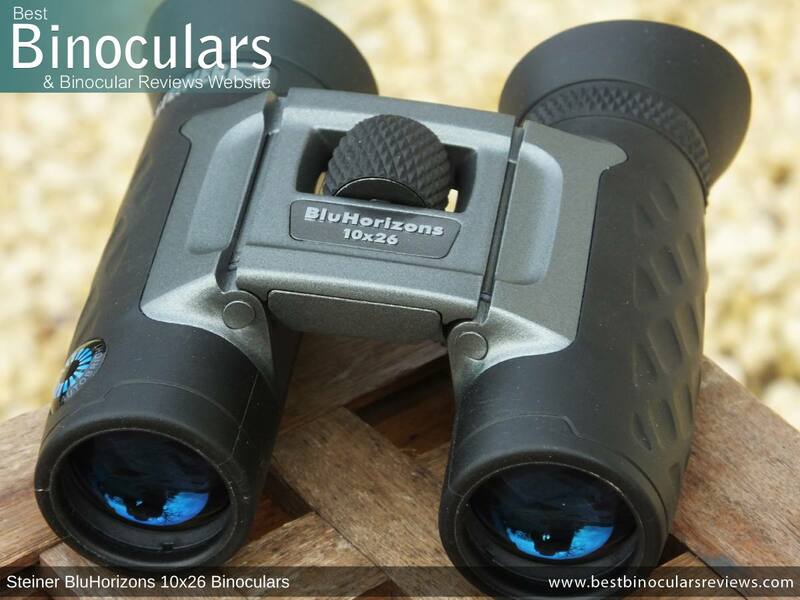 Because of the Autobright™ optics that automatically adjust the brightness of the view depending on the light conditions, judging the image brightness is quite tricky with these Steiner BluHorizons 10x26 binoculars. Working in a similar way to the photochromic lenses do on a pair of adaptive sunglasses, what basically happens is that in very bright light the lenses let through less light and whilst it is subtle, the image looks less bright than if the special coatings were not present. So whilst not quite as bright than those without, the advantage here is that the view is less washed out and so you get an image that is more vibrant and full of color. Then as the ambient light becomes increasingly less bright, the adaptive lenses transmit more and more light, so the effect they have is less noticeable. This system works really well in what I would call good to very bright conditions. However, in low light and just like sunglasses, I would say that these are less bright than an equivalent sized binocular without adaptive lenses. So what this means is that these are great in good to very good light conditions, but even less than ideal in low light than a normal compact. In terms of the colors and level of contrast, the Autobright™ adaptive lenses play a large part. In very good light, both the colors and level of contrast is excellent as the slightly washed out view that you would normally see is reduced. In very low light, I would say that the opposite is true as the image does appear a little duller and so the colors are not quite as vibrant and the contrast between light and dark is somewhat muted. Largely the result of chromatic aberrations, in my experience at least some level of colour fringing is visible in just about every binocular and in general, the higher the magnification, the easier it is to observe. 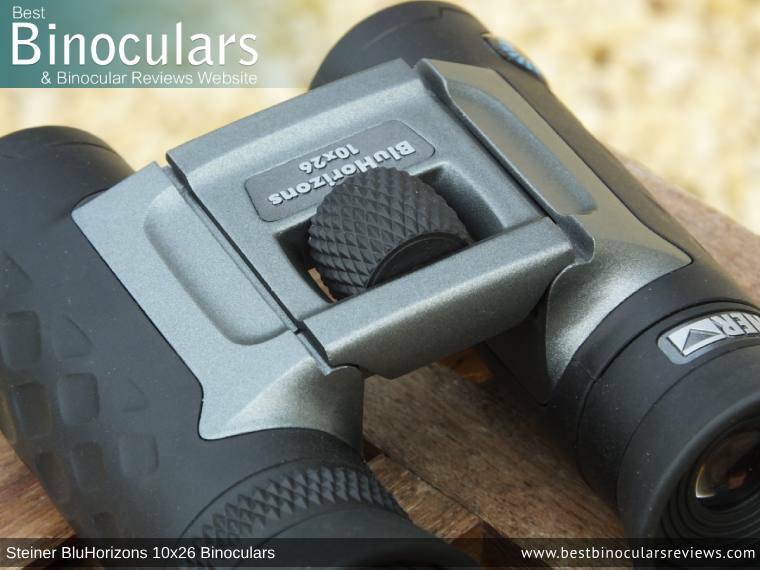 Instruments that well made and use high-quality optics definitely show lower levels of fringing, but in most but the very cases the amount is in my mind perfectly acceptable and this can certainly be said of these 10x26 Steiner BluHorizons binoculars. Sure, if you look closely along the edges of a dark object lit up by a light background, you can see either blue or red fringing, but unless you are thinking about it, it really is not really noticeable or off-putting. 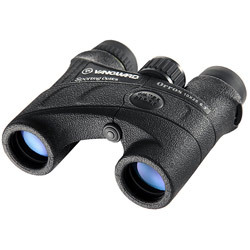 The very low level of fuzziness or softening right that is observable at the edges of the view is impressive on these Steiner binoculars and in my experience I would say is about as good as you could hope for at this price range. In terms of image distortions, a couple of times, I thoughtthat I could observe a tiny amount of curvature right at the sides of the view on my sample. But then I would look again and study the image very closely and I could not find it. Anyway, the point is if it is there the amount is extremely negligible, hard to observe and thus really not something to worry about. I also think that as I had a very early (I think pre-production model on test), I am not sure if this will be the case on the final models that go onto the market, but even so, as I say, if it is there, the amount is very minimal and did very little in terms of detracting from the overall view. 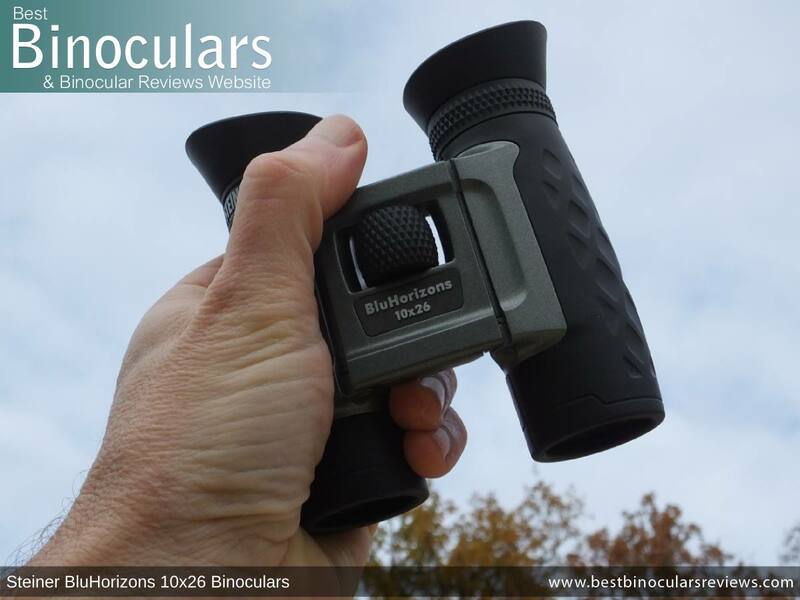 Like many compacts, but even more so with these BlueHorizons, when used under the right conditions (bright light), the view through these binoculars is excellent for a binocular in this size class. The way they adapt in bright light is subtle, but it really works and the image is more vibrant and less washed out than a similar alternative. However, in bad light, the image does look a little darker but having said that, no compact is ideal for use in low light anyway. 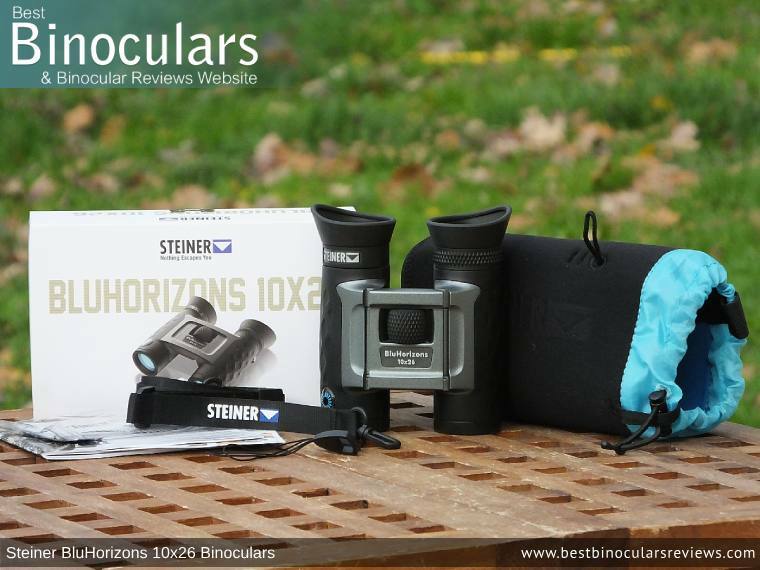 Like the vast majority of compacts, the amount of accessories that these Steiner BluHorizons 10x26 binoculars come supplied with is fewer accessories than which you would expect to receive with a mid or full-sized instrument. So as well as the binocular, in the box, you find a carry bag, neck strap, strap connectors, a cleaning cloth, warranty information and instructions. 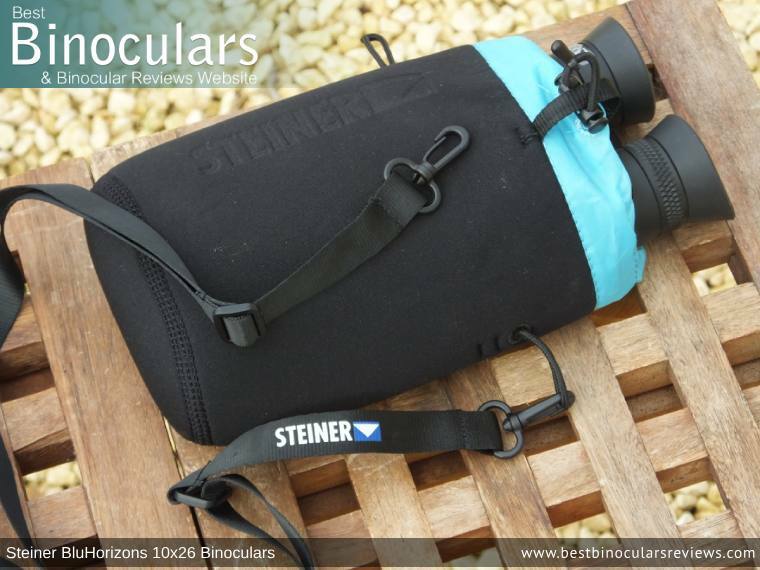 Straying from the norm, these Steiner BluHorizons binoculars come with a soft carry bag and not a carry case. For a lightweight compact like these, this kind of makes sense and whilst it is perhaps not as luxurious as the better cases out there, it is functional and I kind of like it. For me one of its major advantages is how lightweight it is and just how easy it is to carry. 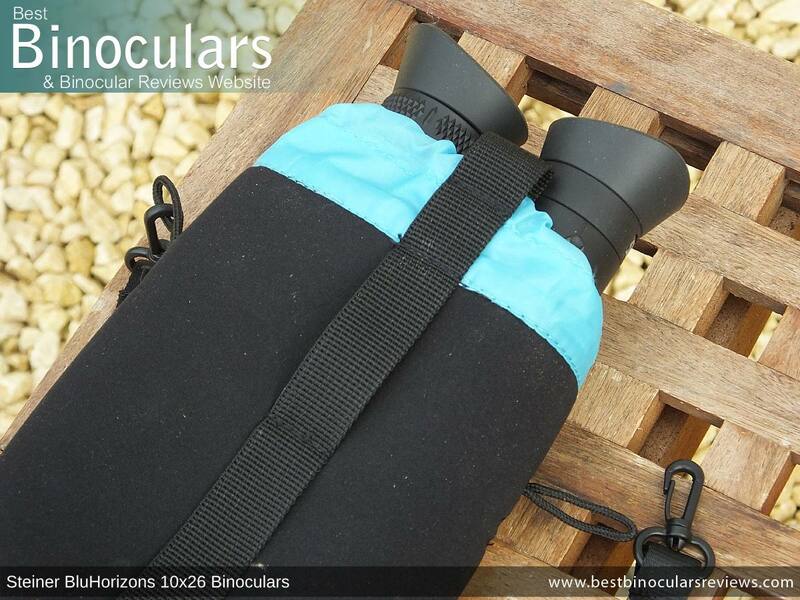 So without the binoculars inside, it can simply be pushed into your pocket should you wish. The neoprene material offers the instrument within a good, but not an excellent level of protection and whilst there are no separate pockets, I did find that I could keep my cleaning cloth and a few other soft items at the bottom of the bag and they would not easily fall out. This is because the bag can be closed via an elasticated drawstring that has a quick release clip. This works well enough and it is relatively quick as well as silent (important for skittish birds and other wildlife) to get your optics in and out of it. The rear side of the bag has a simple belt loop sewn into it which provides you with another way to carry it. You could also use these with something like a Carabiner clip to attach the bag to your daysack or rucksack should you wish. Due to their low weight and small size, most compact binoculars come with pretty simple and often unpadded neck straps. The included Steiner branded strap is similar in that it is unpadded, but rather than attaching to the binocular in the normal way, it comes with a couple of connectors. These you connect to the loops on the underside of the barrels and then connect to the strap via a couple of quick release clips. This works very well and means you can quickly and quite easily remove the strap should you wish. This strap can then also be attached to the carry bag if you wish. However, another and I think better method of carrying the bag is by keeping the neck strap attached to the binocular, putting it in the bag, but leaving the strap out and then tightening the drawstring. Like many compacts, the Steiner BluHorizons 10x26 binoculars don't come with lens covers for either the objectives or the ocular lenses. Considering that the carry bag is so easy to carry about and use, I think that this is totally acceptable and covers would only add to the time it takes to access and then use your binos. 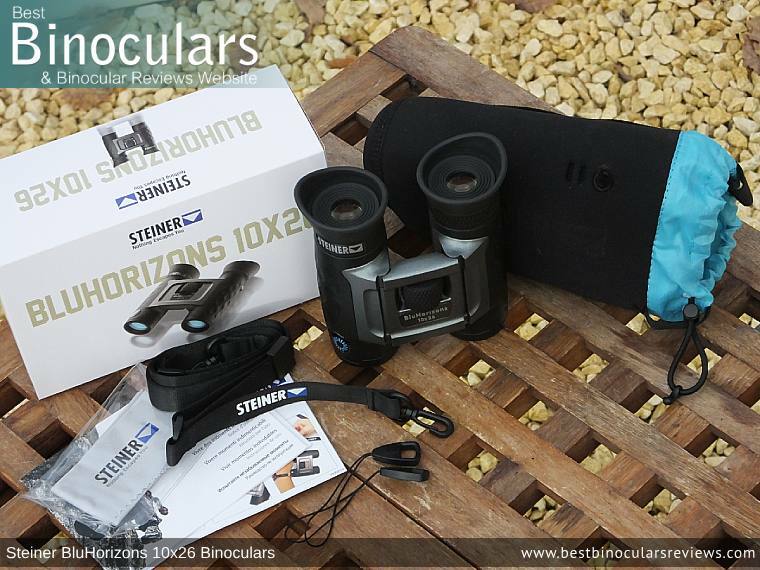 These Steiner 10x26 BluHorizon binoculars come supplied with an excellent quality cleaning cloth which is more than adequate for cleaning the body and certainly for light use on the lenses when out in the field. As always, and as good as the cleaning cloth is, for more complete and safe cleaning of the lenses, I suggest you still get yourself a lens cleaning kit. Steiner's included instruction booklet is reasonably comprehensive and provides you with all the basic information that you need to get up and running as well as cleaning the instrument. 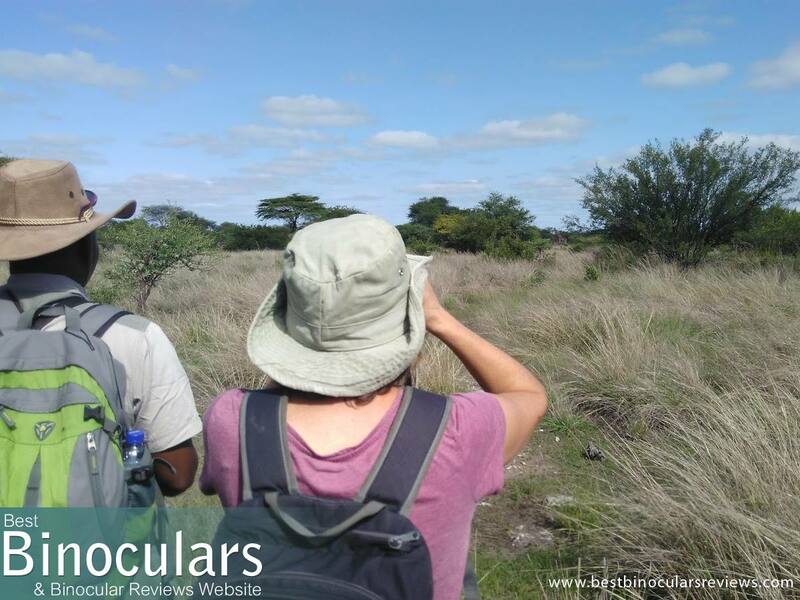 Used under the conditions in which they were mainly designed for, the Steiner BluHorizons 10x26 Binoculars are a great little pair of binoculars and my whole family really enjoyed using them whilst we were on safari (the photo above is of my wife using them on a bushg walk, in the far distance you can just make out a girrafe!) and I would rank them up there alongside the best compacts that I have used at this mid level price range. When it comes to compacts, this is by far the best body design and shape. The whole idea of a compact is to make sure that the device is as easy to carry as possible, otherwise, you may aswell get an instrument with larger lenses. 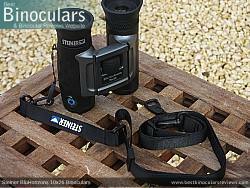 The combination of roof prisms and the two hinges on the bridge make sure the binocular can fold down into a true pocket binocular shape that is much smaller than any single hinge or porro prism compact with similarly sized lenses can achieve. 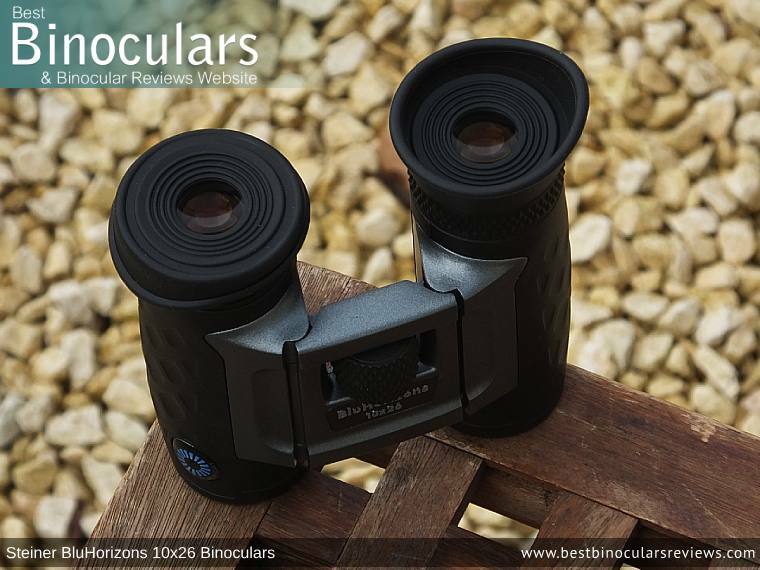 In very bright conditions, the Autobright™ optics that gives these Steiner BluHorizons binoculars the ability to reduce glare and produce a less washed out, more vibrant image is clear to see when you compare them to other optics and this feature works well. So, used under these conditions in which they are designed for this is an excellent feature, but in very low light it does make the view darker than those without. 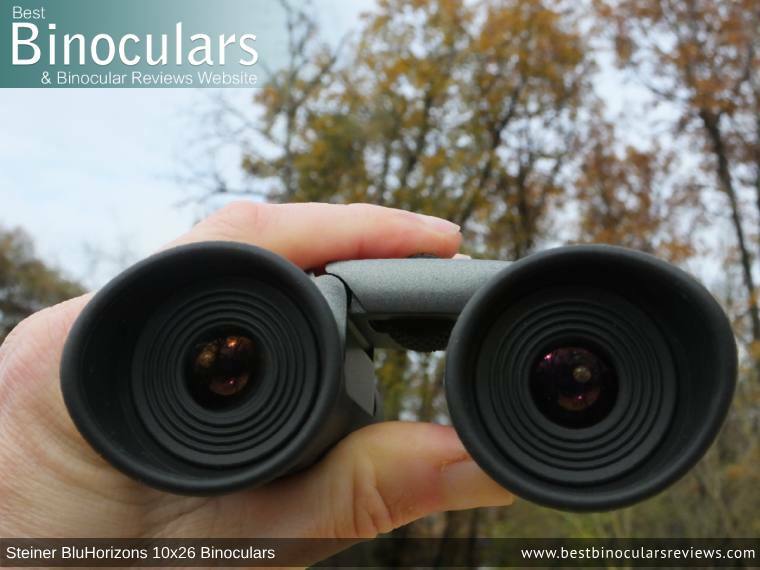 For the most part, the build quality, components and materials used in the construction of the binocular is like most Steiner binoculars - excellent. They look great, feel robust and at this price level, this is just about as good as it gets. Whilst I usually prefer twist-up eyecups, the soft silicone and side-shield design of the eye-cups on these Steiner BluHorizons 10x26 binoculars more than makes up for this as they are both very comfortable to use and help you to achieve the best image possible by preventing any light from entering from the side. These Steiner BluHorizons 10x26 binoculars have an impressively wide field of view. Indeed at 322ft@1000yds, it has one of the widest that I have come across for a compact with a 10x power. For me, it is a little disappointing that this Steiner BluHorizons 10x26 binocular is not 100% sealed and filled with nitrogen or helium to inhibit the internal fogging of the lenses. As you can see below, I think that apart from this point, the anti-glare optics, small size and easy to adjust focus wheel with gloves on really puts them forward as being an excellent binocular for uses like skiing or snowboarding. Skiing - Easy to carry and the anti-glare optics should really help here - however not being fogproof means you need to be carefull when subjecting them to rapid temperature changes.